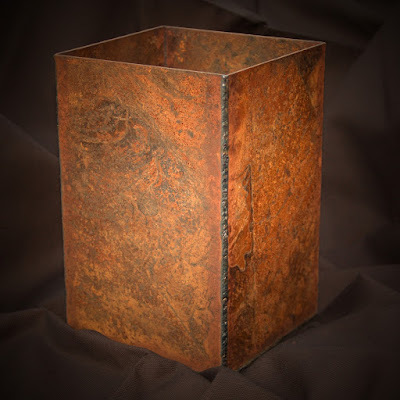 I found some delicious aged and well patina'd steel last week and decided to create some simple steel vessels or vases with it. I love textures and patterns in steel particularly when they are created by natural processes. This steel has been out in the scrap yard for a couple of years stacked with the moisture working away between the metal etching out these wonderful patterns! Each side has a different pattern. To add to the texture, I didn't clean the edges after plasma cutting so when I welded it, I got the classic porous welds. I did that purposely to add to the "raw" nature of these pieces. The vases are sealed inside and out with a satin finish spray-on clear coat paint that can be simply maintained by light dusting. These vases and vessels can be used as decorative pieces in your home to hold dried flowers, potpourri, candle holders, etc., or look great just as they are! They are not, however, water tight or water proof. This will be a limited series due to the limited supply of this particular aged steel. Welded Steel Vase - 9-3/8" x 6" x 6"